Some kids don't get a lot of outdoor time anymore—it's all screens, video games, and trips to the mall. But not your little munchkin! They love to be out in nature almost as much as they love pizza (and that's saying a LOT), and you frequently take them to the edge of the woods behind your house to examine rocks, pick up leaves, and build forts out of branches. Ahhh, that's the life for a tot! Out in the fresh air, prancing around. When your child saw their first deer strut by last week, they were so captivated that you just knew what their Halloween costume ought to be this year! This Toddler's Debbie the Deer Costume is the ideal look for your little nature lover. In it, they can bound through the grass, testing their speed and hopping from one spot to the other. When they tire out, they'll lie down in the grass for a snooze in the sun. So peaceful! This little ensemble will only help deepen your kiddo's connection to nature and their kinship for the woods! It changes them, instantly, into a little fawn, with spotted, ruffled leggings and a tawny brown tunic with a tail. The headband is absolutely adorable, with its furry ears and stuffed little antlers. 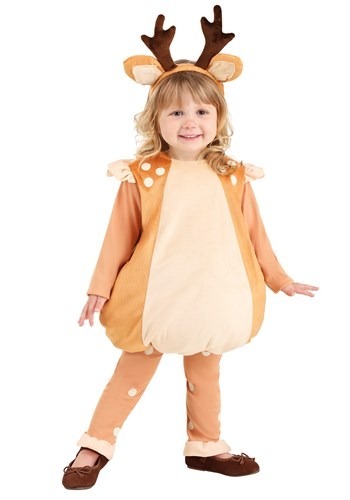 The whole costume is completely transformative without being restrictive, so your kiddo can go on being their inquisitive, adventurous self—just now they'll explore the woods dressed like a deer! This costume will make your child so giddy, they may break out into spontaneous dancing! Of course, this is very rare behavior for a deer, but your kid has never been one to go with the grain. Have fun watching your little critter take the neighborhood by storm for trick-or-treating—we're sure they'll make a "deer" and darling impression.